Our Eugene, OR hotel is your perfect destination. At the Holiday Inn Eugene/Springfield you can expect excellent service during your stay. Our 100% smoke free hotel is conveniently located near many local businesses and area attractions. Just a few miles from the Eugene Airport (EUG), our hotel offers a free shuttle service to make traveling a breeze. Our shuttle is also available to transport you to local businesses around Eugene/Springfield. Minutes from our hotel, youll find plenty of shopping and dining options at the Shoppes at Gateway. Discover the vineyards and breweries located in Eugene and surrounding areas, where youll find something to fit almost every taste. If you are traveling for work you will find many businesses in the area. International Paper, PacificSource, and PeaceHealth RiverBend Hospital are just a few that youll find located near the hotel. Business travelers will find our large meeting space and 24-hour business center ideal when hosting a conference in Oregon. While you stay with us, be sure to take advantage of our wide variety of hotel amenities such as our fitness center and heated indoor pool and spa to help you unwind after your long day. Relax in your room or suite with triple-sheeted bedding, a 32-inch flat screen HDTV and free high-speed internet. 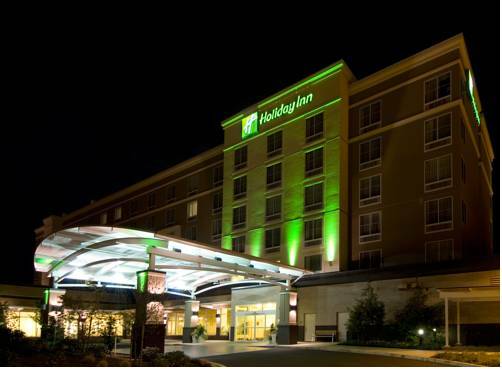 Check in to the Holiday Inn Eugene/Springfield during your next trip to Eugene, Oregon. Cafe Yumm: Vegetarian friendly regional chain serving up Asian inspired rice bowls, plus wraps and salads. Oregon Electric Station: Restaurant complex with 3 lounges in a 1912 former train station offering American fare and live jazz. Hacienda Amigo Mio: Delicious, authentic Mexican food. Hop Valley: Easygoing hangout with patio offering house brewed beer including one off specials plus pub grub. Noodles and Company: Noodles and Company is a fast casual restaurant headquartered in Broomfield, Colorado, that offers international and American noodle dishes, as well as soups, salads, pasta and sandwiches. Ciao Pizza: Relaxed place with a homey ambiance serving wood fired pizza and other Italian eats, plus wine and beer. Track Town Pizza: Spacious old school pizzeria established in 1977 with athlete photos on the walls and sports on TV. Izumi Sushi: Contemporary sushi house with a roomy bar featuring clever rolls and classic Japanese mains. Firehouse Subs: Counter serve sandwich chain offering made to order hot and cold subs, plus a variety of hot sauces. Plank Town Brewery: Northwest style food served with handcrafted microbrews. Panera Bread: Known for its fresh baked bread, this chain offers a healthier alternative to fast food. Noodle N Thai: Beautifully displayed, and tasty Thai cuisine in the heart of downtown Springfield. Boardroom: Executive Style Boardroom featuring built in projector, screen and wireless capability. Chinook Ballroom: The Chinook Ballroom provides 3,700 flexible square feet of event space on the ground level with over 11' ceilings, unobstructed view (no pillars), built in projection and sound system. The Shoppes at GatewayThe Shoppes at Gateway, formerly Gateway Mall, is a shopping mall located in Springfield, Oregon, United States owned and managed by Rouse Properties, one of the largest mall owners in the United States. Springfield Country ClubFeaturing 18 beautiful and challenging holes, practice and teaching facilities, dining and banquet facilities and a welcoming country club . Springfield Country Club is the perfect combination of friendship, fun, and golf at an affordable price. RiverRidge Golf ComplexThree lighted Golf Courses, covered driving range that offers a variety of challanges and practice sites for golfers. Par 71, 18- hole course; Par 32, 9-hole executive course; Par 27, 9-hole short course. Diamond Woods Golf CourseLane County's Newest 18-hole, 7,000+ yards a championship length golf course. A destination in the beautiful foothills of Lane County. Fiddler's Green Golf CenterHome of the nation's largest on-course pro shop. 18-hole, par-3 golf course with a lighted driving range and snack bar. Splash! Indoor water parkYear round indoor water park featuring slides, wave & kiddie pools & a sun deck, plus an adult spa. Eugene Science CenterThe Eugene Science Center, located in Alton Baker Park in Eugene, Oregon, is a science and technology center for children, families, and school groups.